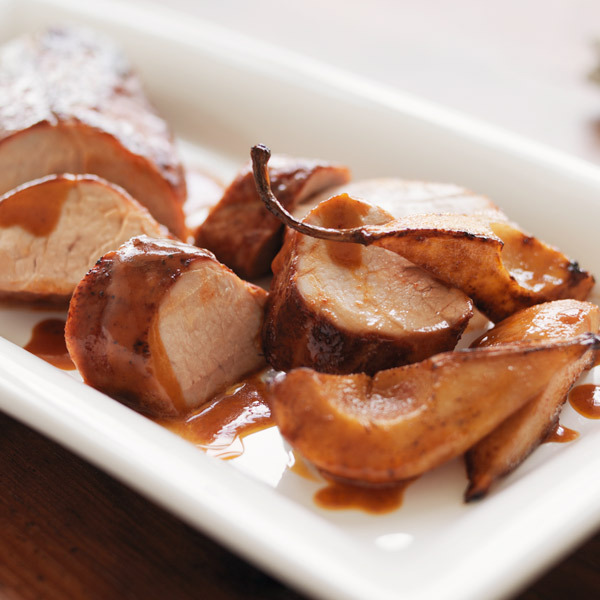 Pork tenderloin is rubbed with a blend of smoky spices, then nestled among Bosc pears that caramelize to sweet perfection. A homemade Dijon honey-mustard glaze tops off this easy roasted pork tenderloin recipe and doubles as a delicious dipping sauce at the table. Preheat oven to 375°F. In small bowl, stir together salt, 1½ teaspoon paprika, 1 teaspoon sugar, pepper and nutmeg. Rub mixture all over pork. Pour oil into 9-by-13-inch pan. Preheat in oven 5 minutes. Meanwhile, toss pears with lemon juice and 1 tablespoon sugar. Place pork and pears (and juices) in pan. Roast 25 minutes. Stir together mustard, honey and remaining 1 teaspoon paprika. Separate into two bowls, one for basting and one for serving. After 25 minutes, brush with baste and roast 5 minutes or until pork is cooked through but still juicy. Let stand 5 minutes. Slice and serve with honey-mustard mixture.